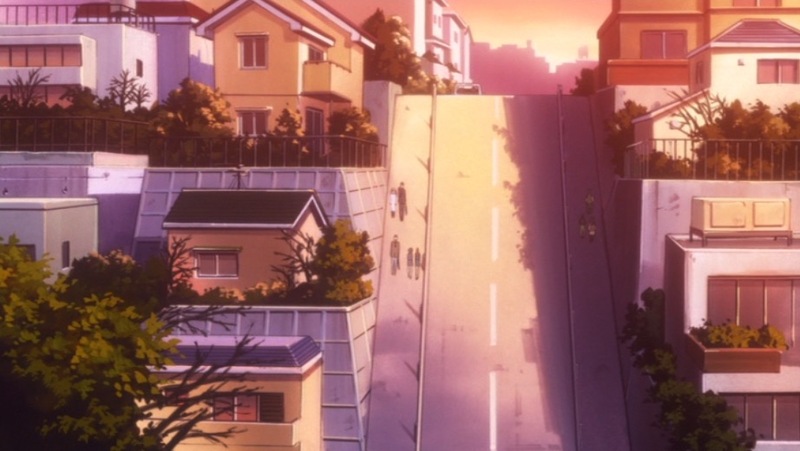 So, with Kitamura’s arc finished and the majority of our main cast in varying states of emotional distress, we dive into what is probably the most intense arc of the show—certainly, it is the arc we all remember for episode 19, and it’s the arc that really truly sold me on this show. By the time I got here in my late night marathon, it was about 2 AM, but I had to take a break at the end of the arc and just sob into my pillow for a few minutes before I could go on. But that’s for a later time. 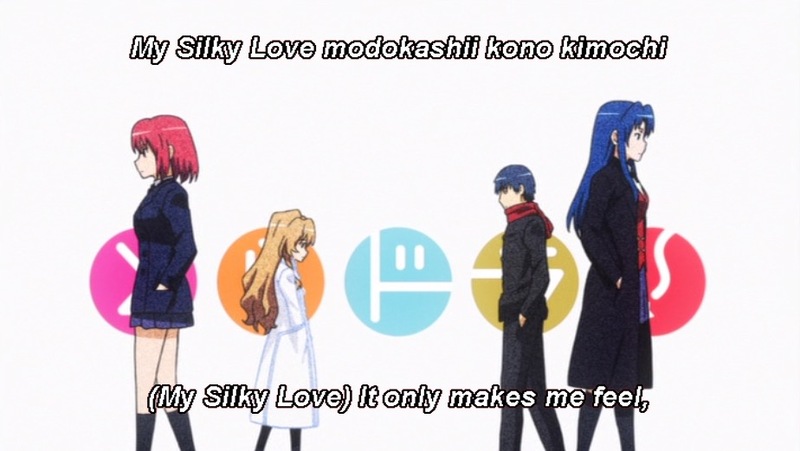 Right now, it’s winter for Toradora! and that means bleak backgrounds coexisting alongside with the bright lights of the holidays. It’s an intentional contrast on the show’s part and we’ll get to that here today. 0:03—There’s a zoom and then a fade. 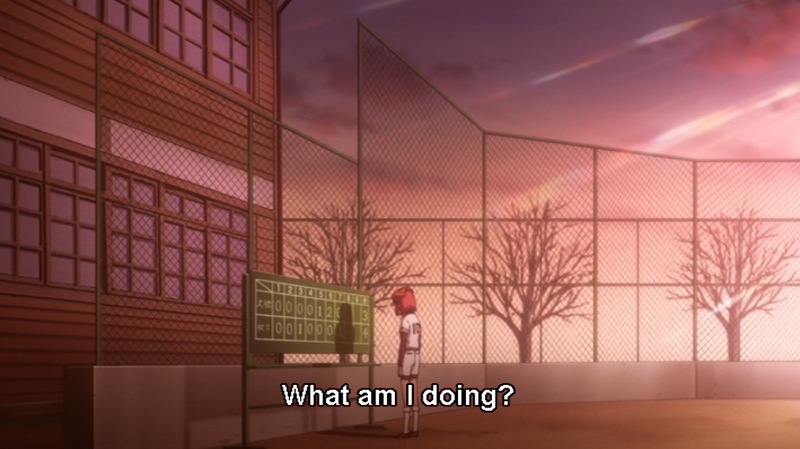 Doesn’t take much time, but it uses the change in physical location to show us exactly where Minori’s mind is, even as her body is in the middle of a softball game. 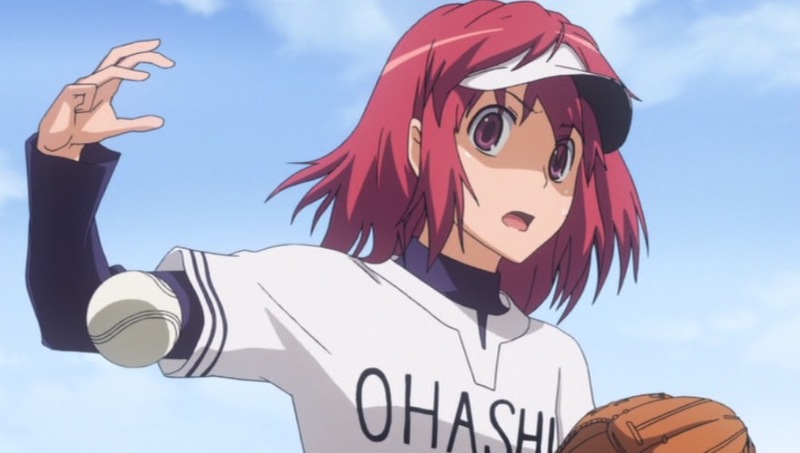 0:27—Yet another moment the still shot doesn’t do credit, but this slow-motion cut of Minori dropping the ball is really nicely animated. 0:36—Man, that is STARK. Barren trees and an empty schoolyard surround Minori as she literally stares down her own shadow. 0:51—New OP, and holy crap the melancholy is strong here. Also wonder how I didn’t remember this OP at all. Great visual style, great song. 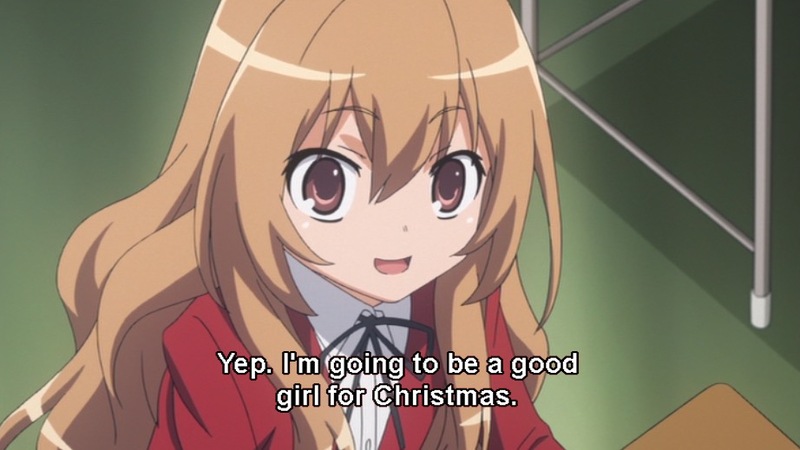 2:35—Child Taiga is strong in this scene, as is her more honest side. Her actions throughout the entire episode back up what she says in this scene. She really does love Christmas. 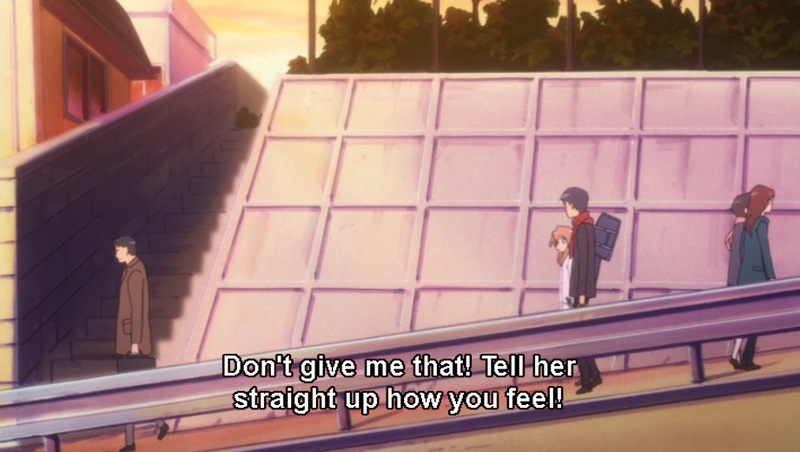 And that, I think, is the line Toradora! is drawing in the sand here: childhood goes with authenticity of emotion, adulthood with duplicity and deception. But we’ve still got a lot of time to spin out this theme, so it’s good to just continue watching and see what happens. 3:16—As a lot of random people (mostly at the grocery store) have been fond of pointing out to me, the holidays aren’t a joyful time for everyone. Yet, most of them still put on a happy face. 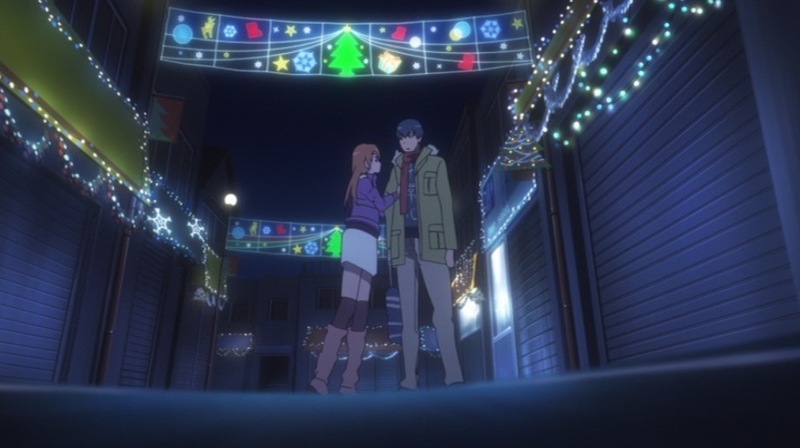 I think it’s pretty informing that the things Taiga says she likes about Christmas (smiles and lights) are very surface-level expressions of the holidays. 3:46—No rest for our weary hearts! The playful music that has accompanied this conversation cuts out abruptly and we’re left to face the serious stuff without defense. 4:13—Yes! I’ve talked before about how I think Ryuuji is the most stagnant of our main case, the one who’s made the least changes to himself from the start of the show. 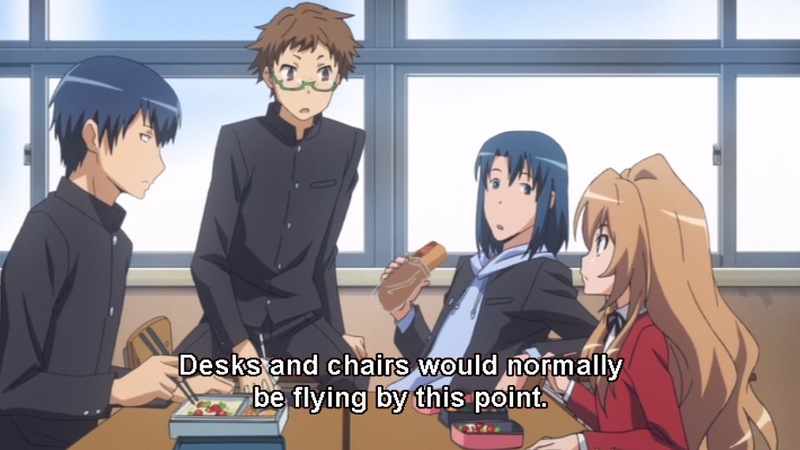 To this point, we’ve seen him make maybe three subtle towards getting Minori to notice him, and zero overt ones. He needs to act, and stop letting other people do it for him. 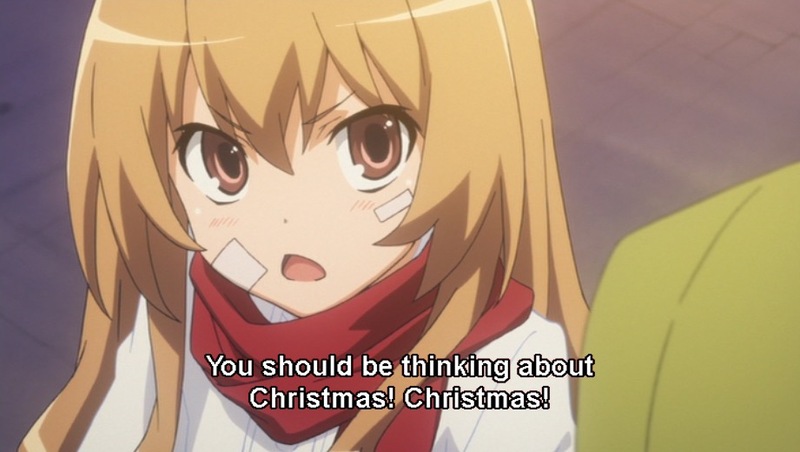 4:33—Dear angel Taiga, please come save my holidays too! 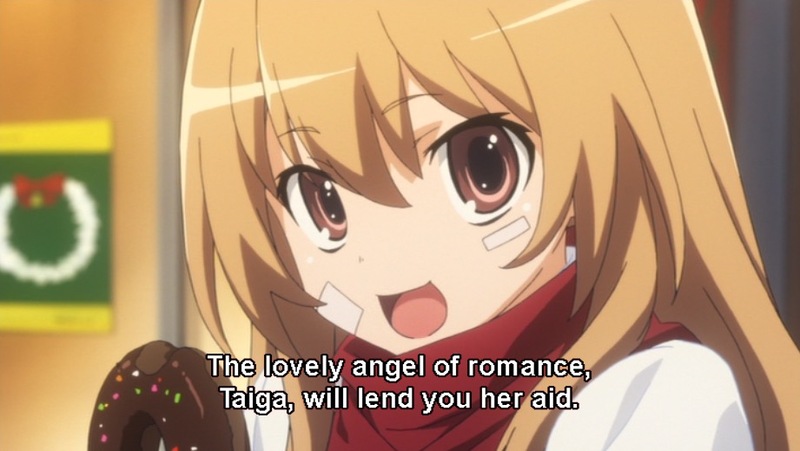 4:51—”Lovely angel Taiga is willing to shed a layer or two to bring everyone a happy Christmas.” Whoa. Now, I think she was talking about wearing coats or something, but holy cow the first thing I thought of was layers of emotion or fakeness. 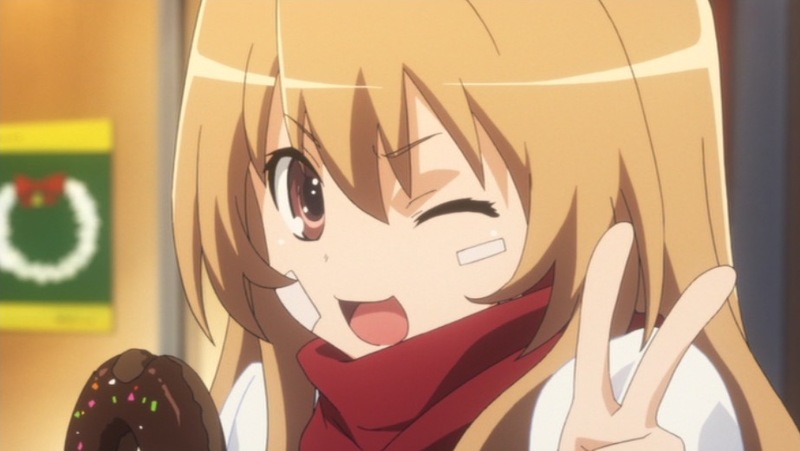 In other words, Taiga’s saying she’s willing to take on more pain in order to support others. 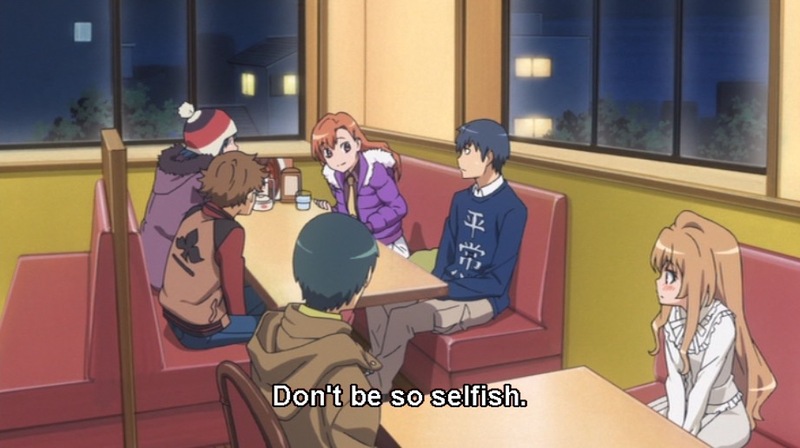 5:52—Lol Taiga’s ego. 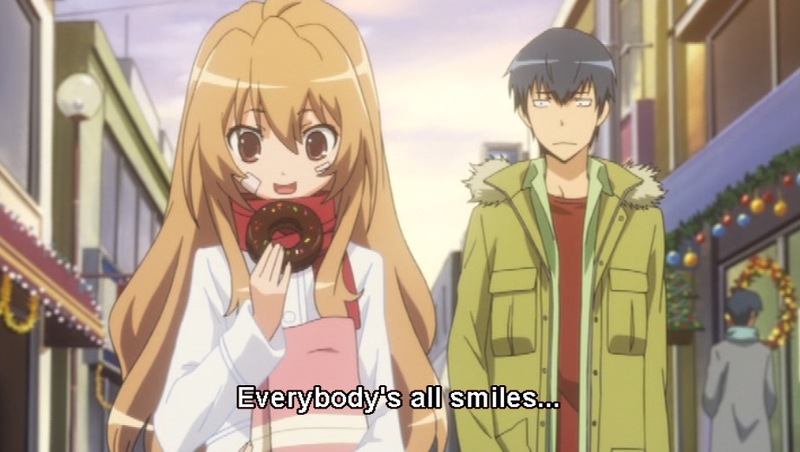 But there is, like with a lot of things in this show, a hidden edge of sadness in the fact that Taiga’s been made a school hero for an event that brought her nothing but pain. 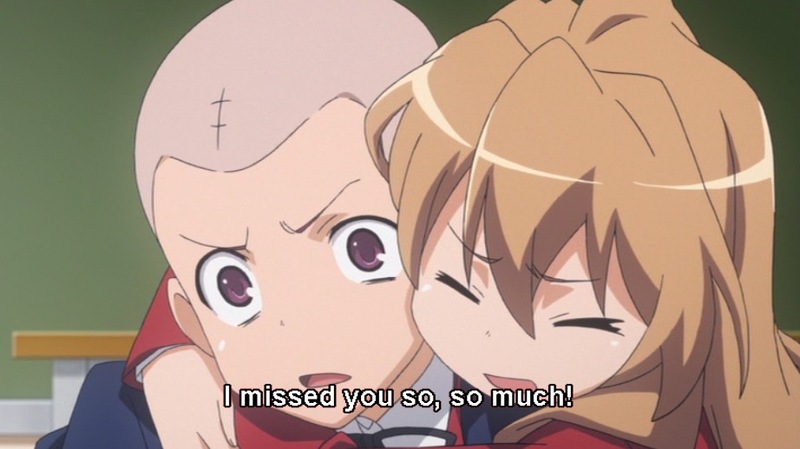 6:19—Yup, Taiga loves Minori a whole lot. 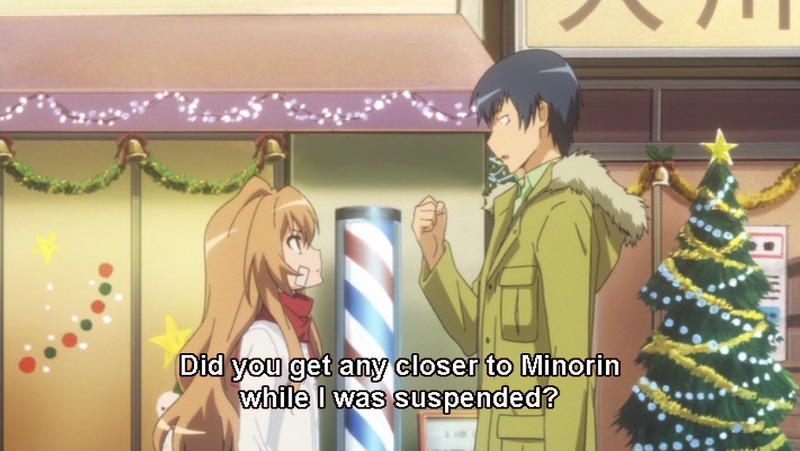 But, yikes, Minori looks anything but happy to see Taiga. 6:45—Fishbowl perspective for this one. 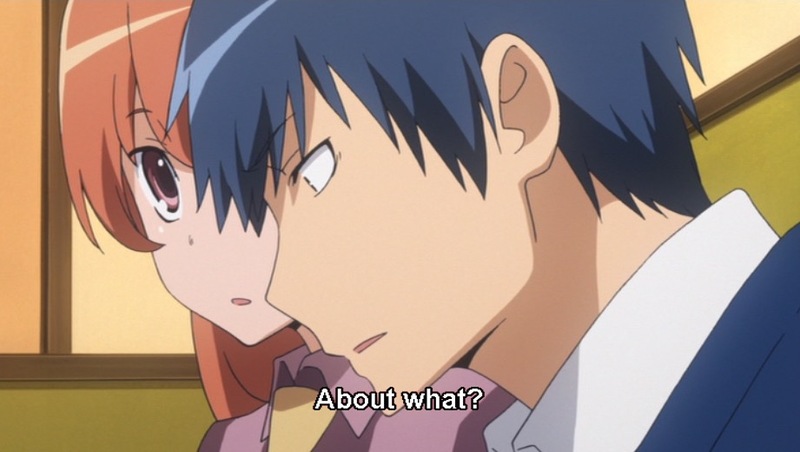 It’s been quite a long time since we saw Toradora! use comedy camera to emphasize comedy moments because there really haven’t been all that many purely funny moments for it to do so. 7:06—Even this one isn’t really funny. 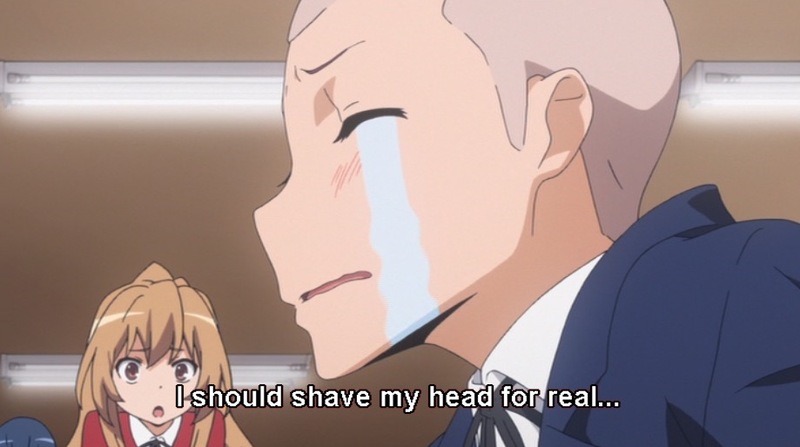 Minori’s going over the top, but with the hair reference I’m having flashbacks to Kitamura’s breakdown. Minori is a person in pain right now, not a stand up comedian. Which brings me to a totally unrelated tangent, but I’m thinking about Minori’s multiple jobs, her desire to believe Ami is a mature adult who is always doing the right thing, and this childhood versus adulthood theme. By taking on job after job, when jobs are often the prime indicator of adulthood, is Minori trying to make herself believe that she is an adult herself? 7:23—More great comedy camera, made hilarious by the fact that Kitamura is perfectly straight and the other four are in perspective. 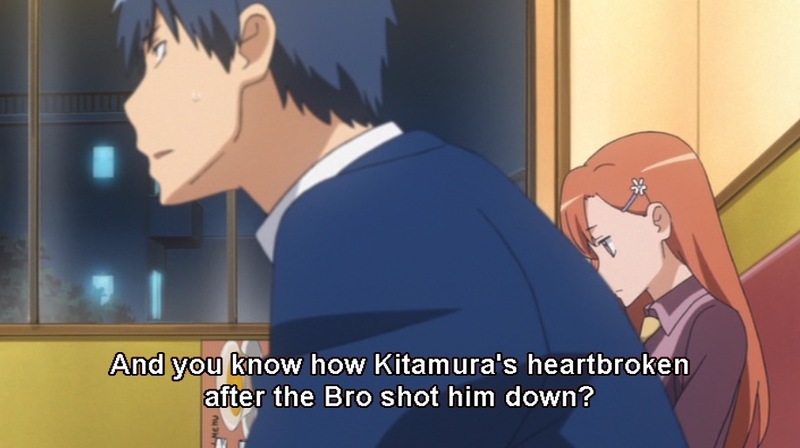 Kitamura is, visually, the “straight man.” LOL. 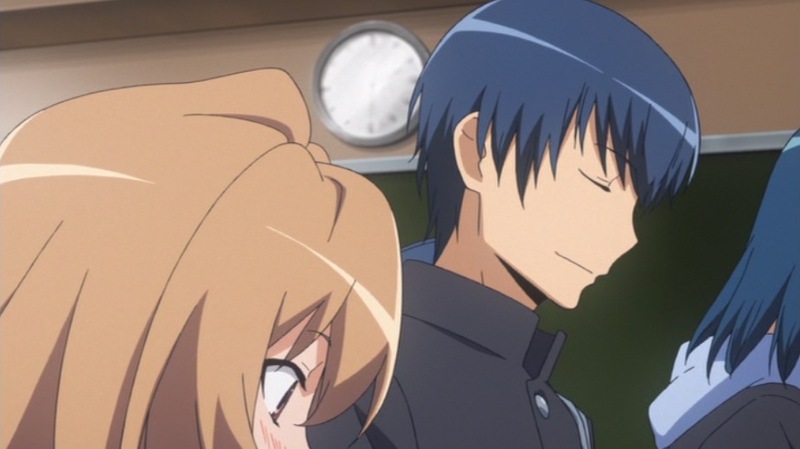 8:10—More of Ryuuji noticing when Taiga’s happy and being happy himself. It never, ever stops. 9:07—This line hit me as funnier than it should have. 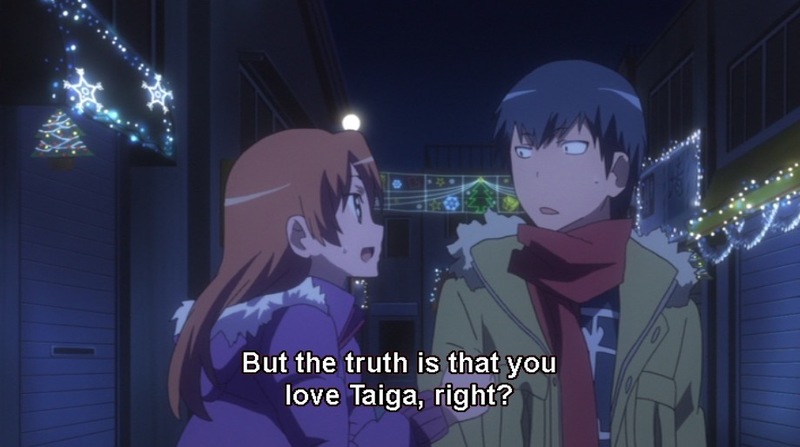 9:34—Taiga’s echoing Kano’s words here, but…does she really believe them? 9:57—This is a cool observation to get from someone outside the main cast. 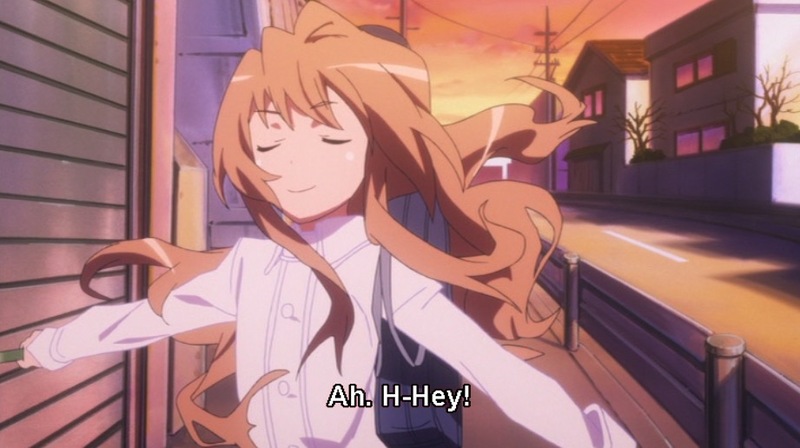 Taiga has changed, and people talk to her now. But notice this happens after she’s had a public watershed of pure emotion. 10:06—The answer to the question from 9:34? Nope, she doesn’t accept that legends and superstitions are just that. 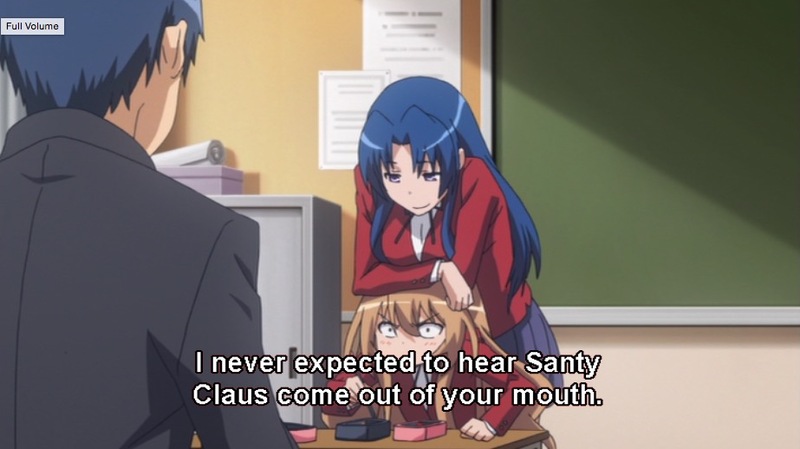 After all, look at how seriously she takes Christmas. There are two options: 1) she really does believe in Christmas, or 2) she’s desperately, desperately pretending that she can and does. 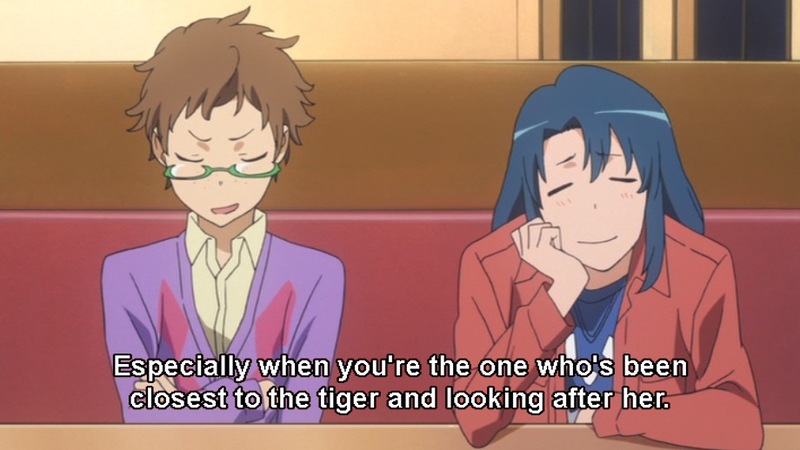 10:15—Of course this comes from Ami, the voice of the realist. 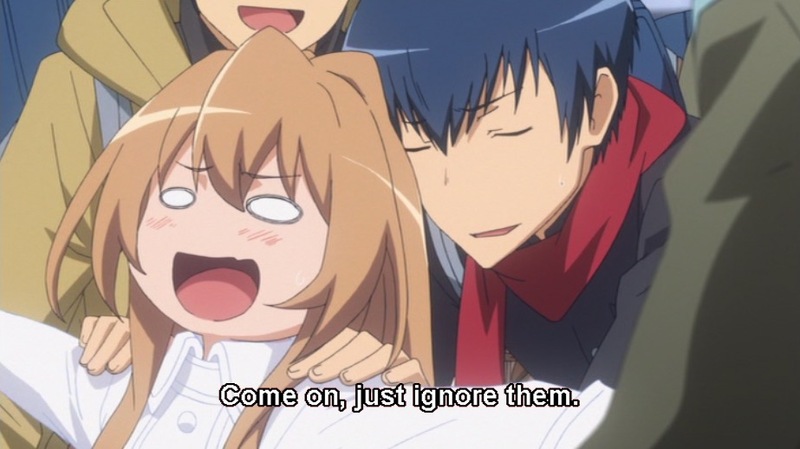 By the way, she and Taiga are totally friends now. 10:52—Whoa! We’ve never seen the classroom from this angle before! Really cool stuff, and it comes as Kitamura is announcing the Christmas party. Literally everything has been turned around. 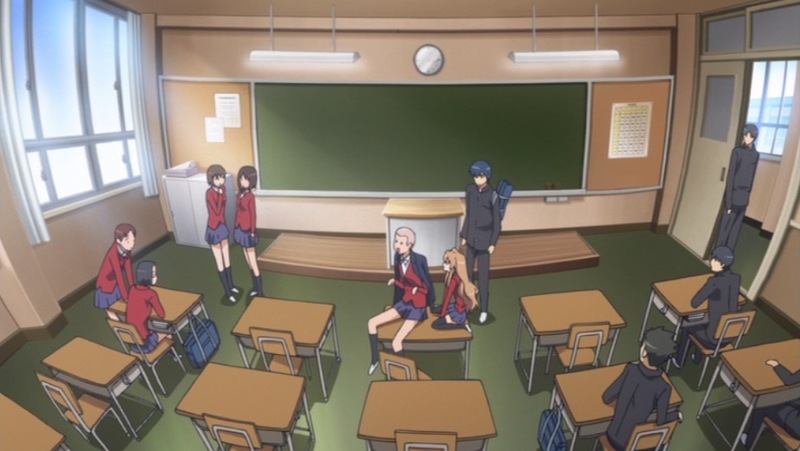 11:14—Taiga campaigning for Ryuuji to be honest, to do what she and Kano have done, to risk getting hurt. 11:47/11:48/11:49—Been a while since we’ve seen fun smeary animation like this, too. 12:18—Jazz music plus the shakey camera is suuuuch a good way to invoke the atmosphere they’re going for with this scene. 13:00—Quiz time: whose face is showing something when they think no one’s looking in this shot? At this point, most of Nagai’s visual tricks are out in the open, but they work so well it doesn’t matter. 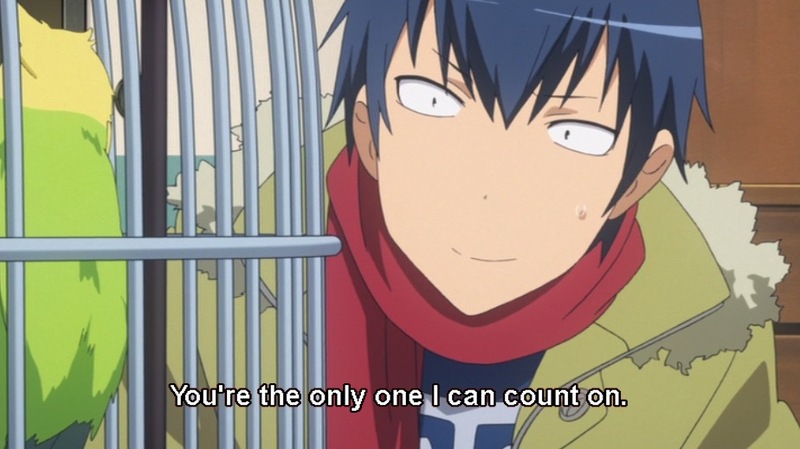 13:21—This is about as assertive as we’ve seen Taiga with Ryuuji. It’s no strange thing for her to pull Ryuuji along with her, but this feels a little bit different because she’s no longer isolated from the class. 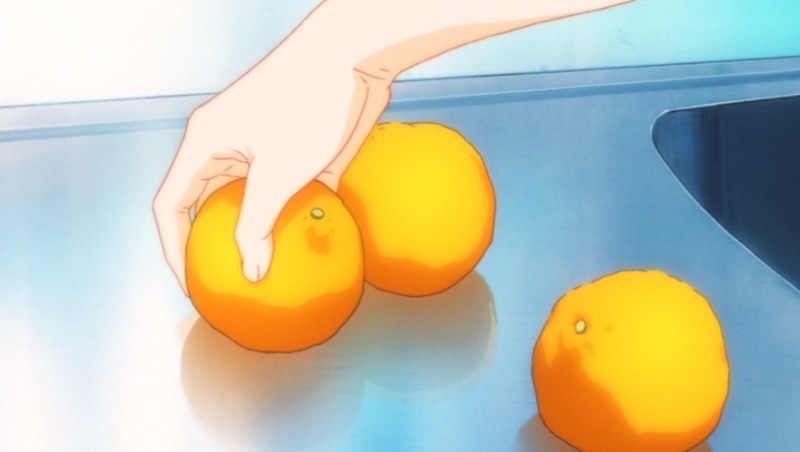 She’s, more or less, been accepted and doesn’t really need Ryuuji for this. But she demands him anyways. 13:54—Minori’s telling us what’s important to her. Right now, that’s saving face, maintaining her mask of self-dignity. 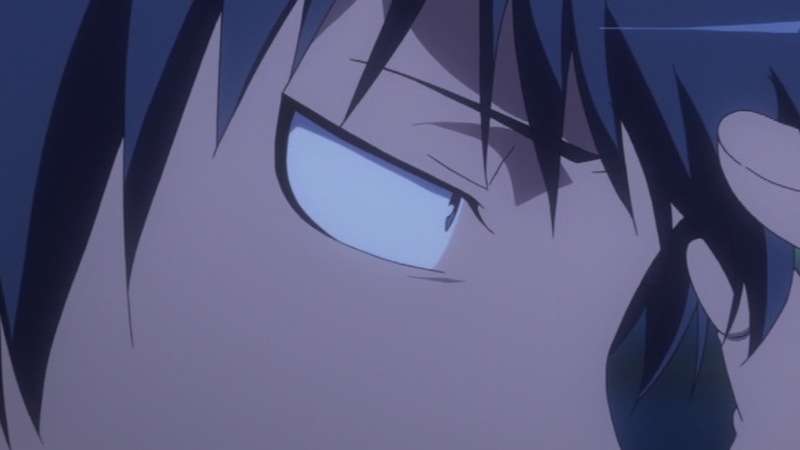 14:23—Pretty passive-aggressive stuff here and Ryuuji knows it. 14:36—I love how overbearing she is in this shot. She’s crowding into his part of the frame, just like she’s pressuring him with her words. 15:46—When you have to ask your half-dead bird for help…you’re probably screwed. 16:24—This show has some great comedy. 17:06—YUP. 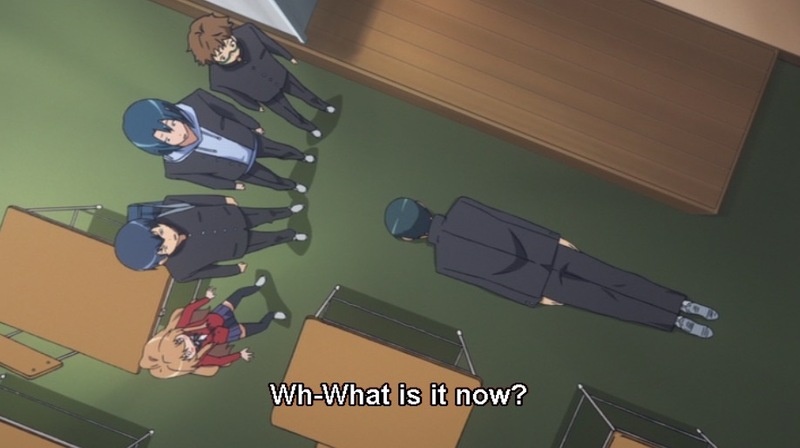 Times and the people around him are changing, but Ryuuji is trying to cling to the status quo. 17:56—He wants to believe this really badly, doesn’t he? 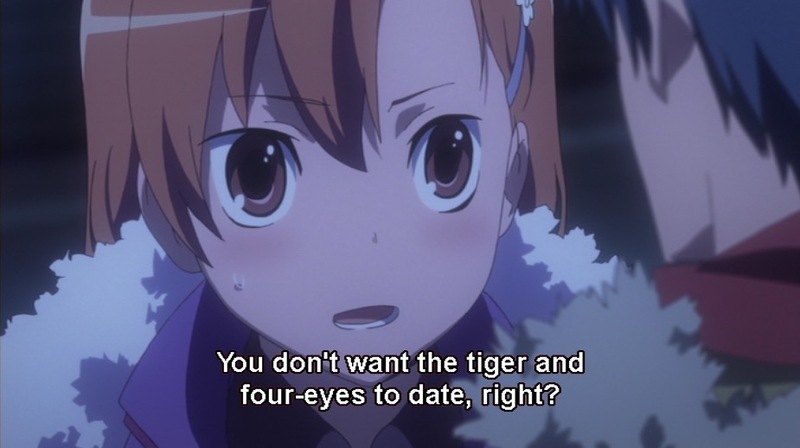 But he can’t even look Taiga in the eye when he says it. 19:52—Just kidding, it’s Kitamura that they really love. The guy who put everything out there in front of the whole school. The authenticity of his emotion has legitimately won people over. 20:13—How can these guys be so smart and yet so dumb? 20:22—”You’re so wrong…” Whoa. You know what that looks like to me? Part of Ryuuji’s own mask starting to crack. 20:54—His status quo is being invaded, and he really doesn’t like it. 21:25—It’s like, really being invaded. But it’s so very much the right time for this to start happening. Narratively, we really need Ryuuji’s comfort to start being disturbed. The longer he blindly clings to the past, the more the story risks painting him as a bad guy. So, he’s now starting to get pushed in ways that will eventually force him to change. 21:33—This is merciless writing brilliantly delivered through a character who probably doesn’t actually believe this, but who really wants to. Sound familiar? 21:42—A very pretty shot, with the curvy ground included! 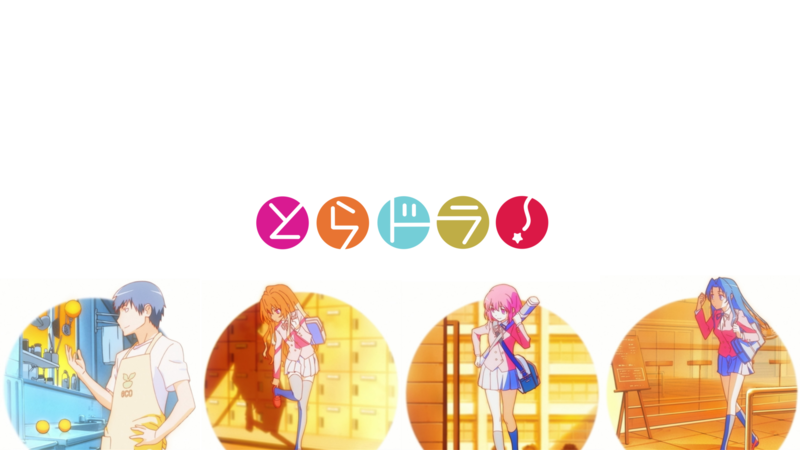 22:21—I really love the color palate for the new ED. I need to listen to it a bit more before I really decide, but I think I still like “Vanilla Salt” more. And, because I like the colors so much, let me share a wallpaper with you guys! It’s happening, guys. 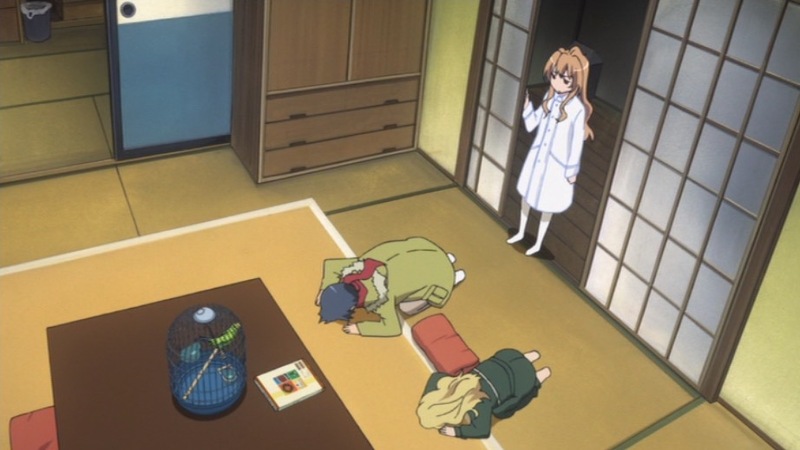 Only one episode left before The Big One, Toradora! really isn’t going easy on any of its characters anymore. With Ryuuji starting to get the beginnings of character development, you can be sure that big changes are on the way. 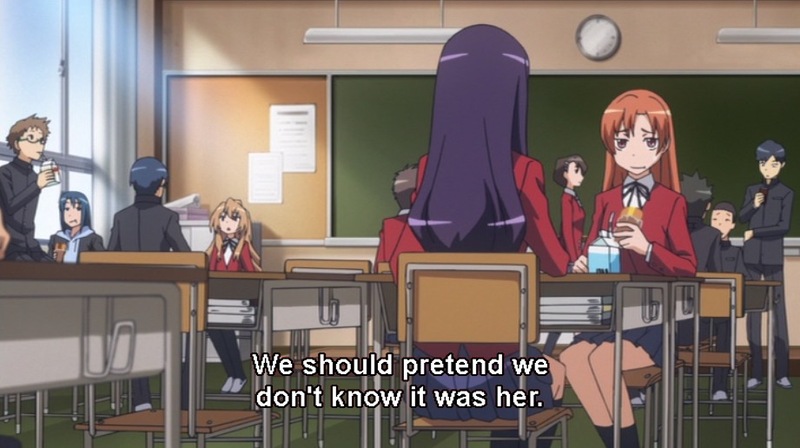 Taiga said this episode that Minori and Ryuuji have both changed, but I think it’s much more that she’s changed and now has a sort of undefined sense of the inauthentic nature of their weird crush thing. 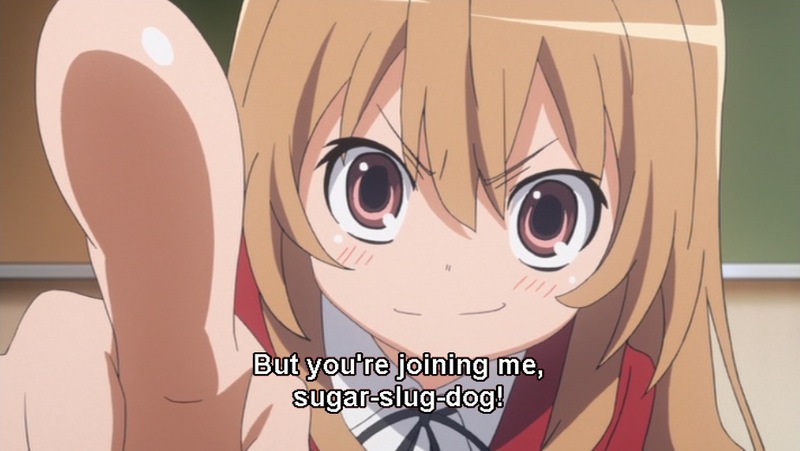 But Taiga seems to be on a war path against herself as of late, putting herself in harm’s way for the sake of others. 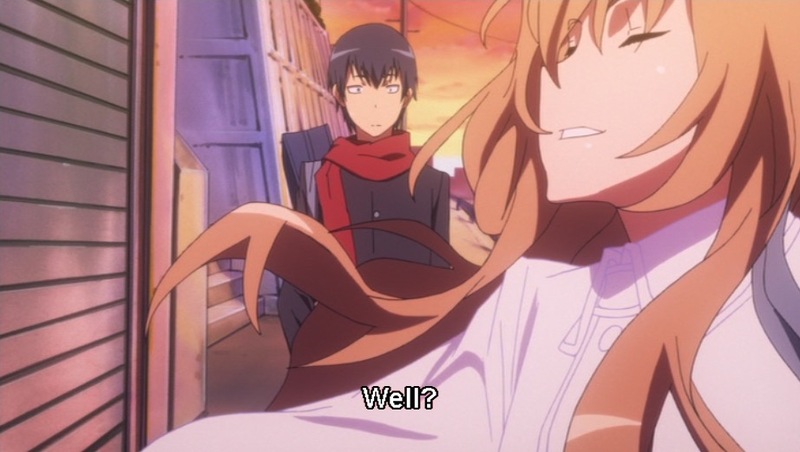 I noted after the school festival arc that I thought Taiga was closing herself off, and I think her actions since then have seen that theory validated. We’ve seen the results, though, of what doing that does to her. Another explosion seems inevitable. 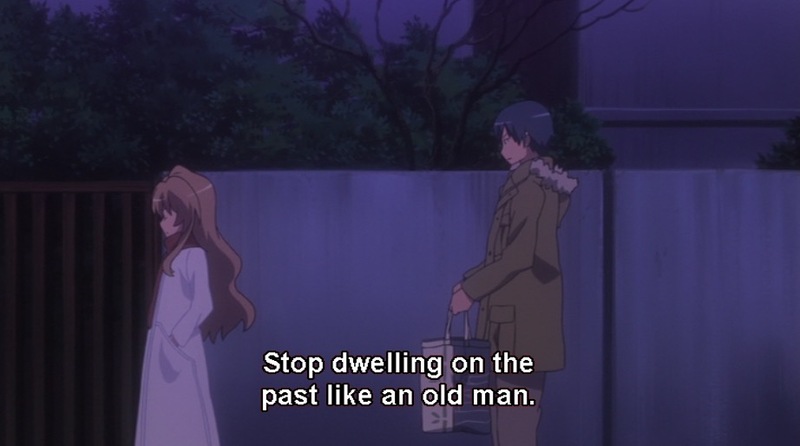 I do think that childhood/ adulthood, or more precisely, adolescence/adulthood is definitely a theme in Toradora. 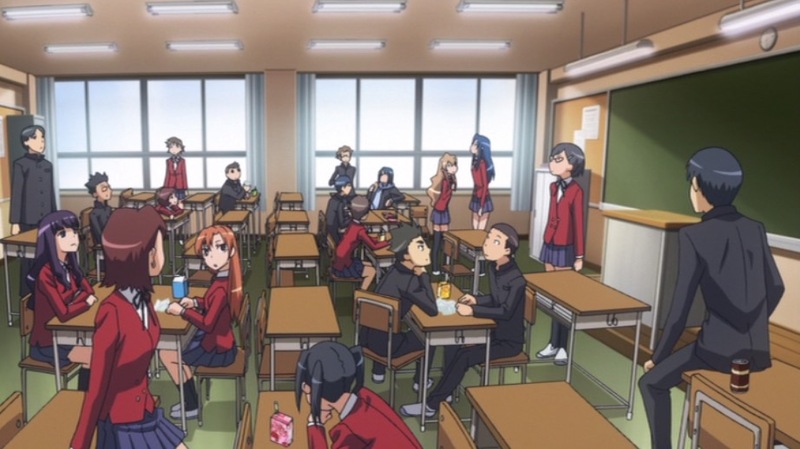 But just as Toradora subverts so many anime tropes, it also subverts the idea of a dualistic conflict between adolescence and adulthood. If we look at the adults, we see some of the most juvenile behavior in the show. The open, loving, child-like Yasuko, Taiga’s childish, irresponsible, self-indulgent Dad, and the whining, infantile Class 2-C teacher. Remember as Rijuji and Taiga leave on their summer trip, Riuji is basically running down the household list that a parent would give their son or daughter as they leave that kid at home alone for the first time. Roles are turned on their head here, Riuji is the Daddy, and Ya-Chan is the child. Perhaps this is why we have not seen much evolution in Riuji. He’s too busy being a caregiver. Will he learn to be a kid and feel and act on his own behalf? 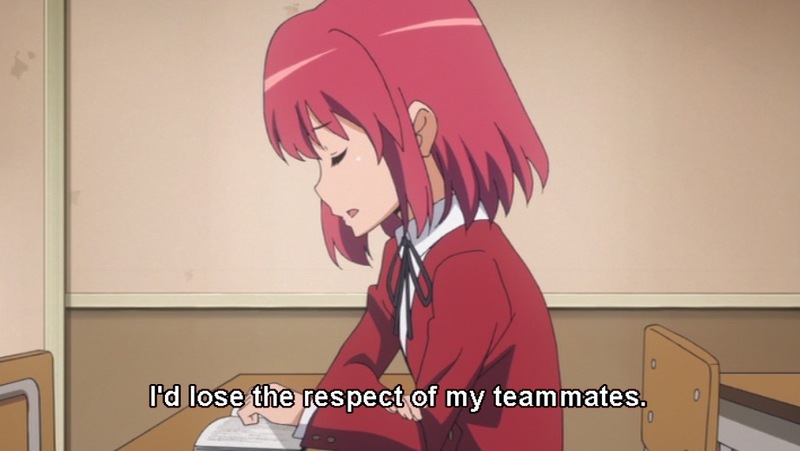 Will Minorin give herself permission to be a scared kid? With Kitamura it came on like a storm, With Ami, she doesn’t know which world she belongs in. 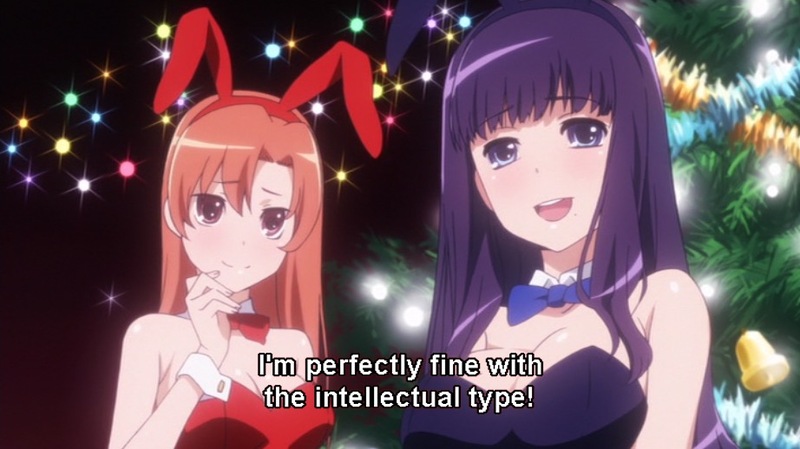 This is Ami’s big error, believing that these are distinct planes of existence. Humans do not exist in a binary Child/Adult state, we’re all a confused mess. 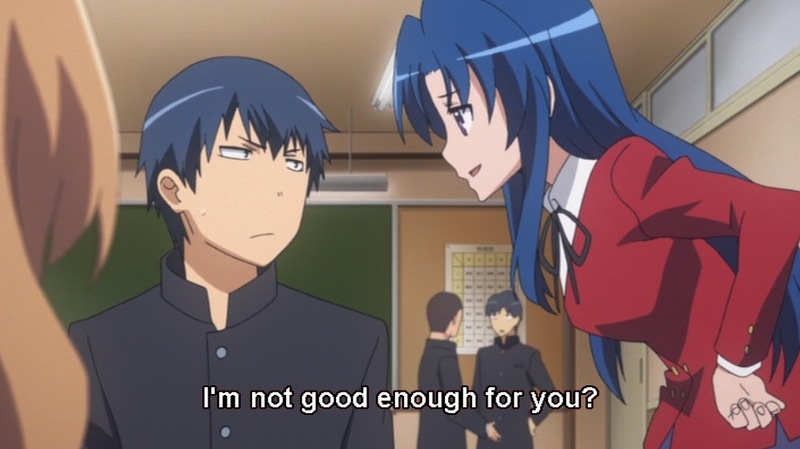 This is, I think what Toradora is saying to me at this point. Man, that is a great comment you’ve left for me to mull over. You’re totally right. It isn’t a binary and this has shown up time and time again. 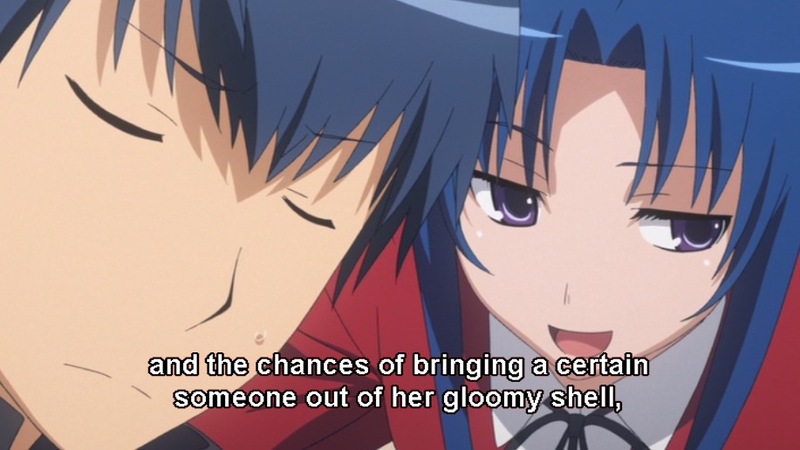 I’m thinking right now of episode 14, where Ami calls Ryuuji a child, only to have him say the same thing to her later. Ami may be “mature” and “adult” sometimes, but at others she’s very much a kid. 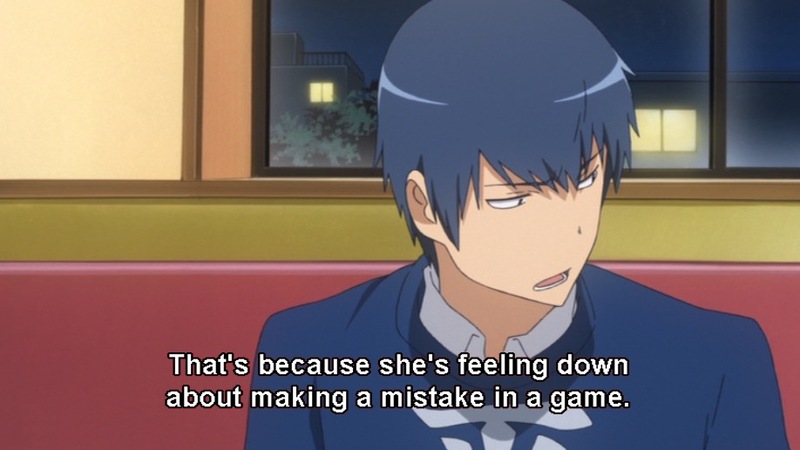 As far as you Ryuuji goes, I think you’re absolutely right. He’s been far too constrained in the roles he’s been given to grow out of them. 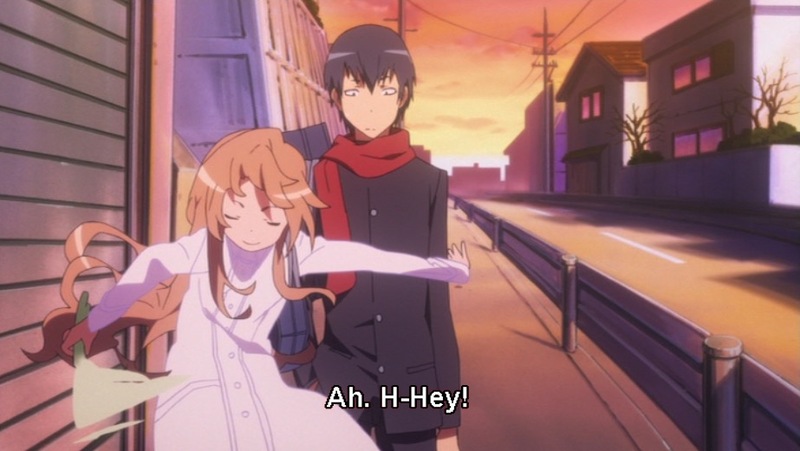 But Taiga is struggling to make herself somewhat independent of him. 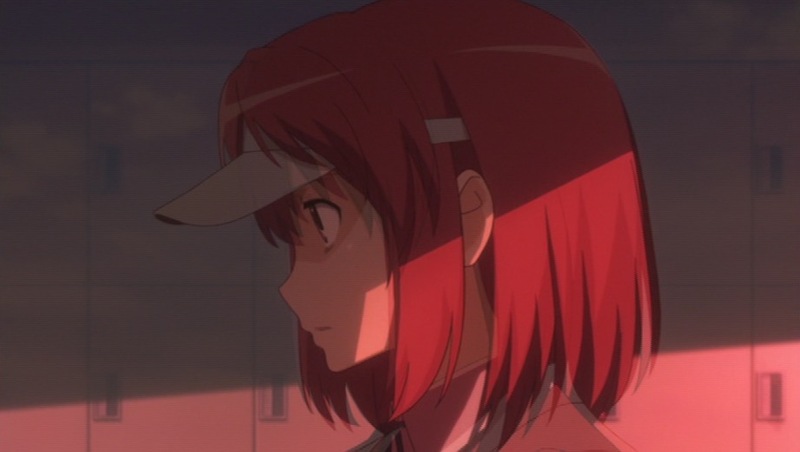 I think she, not Minori, will be the key to unlocking Ryuuji’s cage and letting him finally grow.